Habit: Annual, perennial herb. Stem: erect; branches ascending. Leaf: basal and alternate, simple, sessile or petioled, entire or dentate, 3-veined from base. 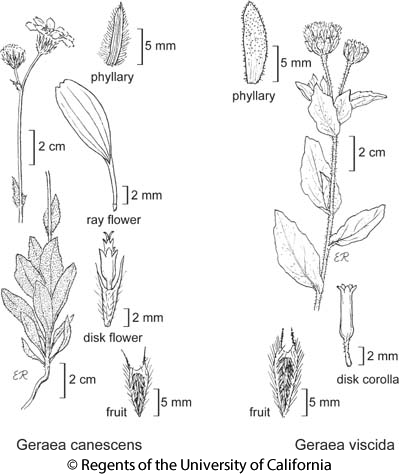 Inflorescence: heads radiate or discoid, 1 or in few- to many-headed cyme-like or panicle-like cluster; peduncle +- elongated; involucre hemispheric; phyllaries +- equal or weakly graduated in 2--3 series, free, green; receptacle paleate, palea folded around and falling with fruit. Ray Flower: 0 or 10--21, sterile; style 0; ray yellow. Disk Flower: many; corolla yellow, tube slender, throat gradually expanded, lobes triangular; anther tips ovate, +- acute; style tips triangular. Fruit: strongly compressed, narrowly wedge-shaped; edges +- white, long-ciliate; faces black, +- hairy; pappus of 2 narrow awns. Habit: Herbage densely glandular-puberulent and +- bristly. Stem: several from caudex, 3--10 dm, simple or few-branched. Leaf: 3--9 cm; blade ovate to oblong, obtuse. Inflorescence: heads discoid, 1 or several in +- flat-topped cyme-like cluster; involucre 10--15 mm; phyllaries narrowly lance-oblong. Disk Flower: corolla 6--8 mm. Fruit: 7--10 mm; pappus awns 3--5 mm. Chromosomes: 2n=36. Citation for this treatment: David J. Keil & Curtis Clark 2012, Geraea viscida, in Jepson Flora Project (eds.) Jepson eFlora, http://ucjeps.berkeley.edu/eflora/eflora_display.php?tid=3055, accessed on April 20, 2019.
s PR (s San Diego Co.); Markers link to CCH specimen records. Yellow markers indicate records that may provide evidence for eFlora range revision or may have georeferencing or identification issues. Purple markers indicate specimens collected from a garden, greenhouse, or other non-wild location.